Injuries will happen in your lifetime. They can occur more often at certain jobs or around the house. No matter what, always be prepared for an injury and how to address it immediately. Taking precautions, being alert, and having the right tools in place to prevent an injury can significantly reduce your chances of getting hurt. Even with precautions, an injury may happen after a fall, contact with a sharp object, or another painful event. Injuries by definition are the physical instances where a person gets injured. These physical events include bruises, bone breaks, sprains, cuts, lacerations, gouges, and other types of wounds. Wash your hands and stop the bleeding by applying pressure to the cut with a clean cloth. Clean the wound with water and then apply an antibiotic or petroleum jelly to disinfect it. Cover the wound with a bandage or gauze. Make sure to replace the bandage daily to avoid any infections. Get a tetanus shot if your vaccination isn’t up to date (five years) or if the wound becomes increasingly infected under the bandage. See a doctor or urgent care provider to treat any wound that becomes worse over time. R – Rest the limb/joint that you sprained and use crutches or a brace as needed. Consult your nearest provider about whether or not you should avoid putting any weight on it. Some minor sprains still allow a person to exercise regularly. I- Ice the sprained area with a cold pack as soon as you sustain the injury. A person should ice their sprain roughly eight to ten times a day for 15 to 20 minutes within the first 48 hours. C- Compress the sprain with an elastic wrap or bandage. After applying first aid to your injury, evaluate the severity of the injury to guide your next steps. Any minor injuries that you sustain can be treated at an urgent care center including cuts, lacerations, bruises, sprains, and flu symptoms. However, if your injury is severe in nature you should find the nearest emergency room (ER). A severe injury that is life-threatening requires an ER equipped with life-saving technology and services. 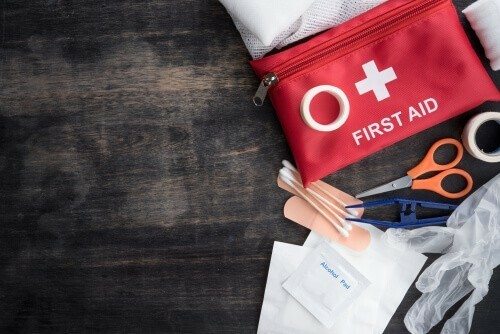 Use these first aid basics and tips to address injuries and create the most optimal health outcome post injury!